Leeks are an often forgotten and under-appreciated member of the allium family. At times their delicate flavour can be ruined by unnecessary boiling or by drowning them in heavy sauces. 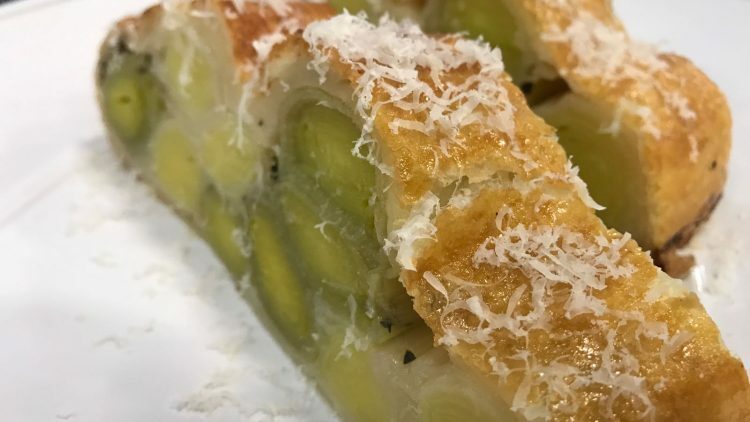 This recipe was inspired by a classic Michele Trama dish of pressed leek terrine, which Marco Pierre White later adapted to a leek and langoustine version. This is my version. Start with the leeks. Trim off the darker green ends, if the outside of the leek is a bit dry and damaged then peel them off. Drizzle the leeks with some rapeseed oil and give them a good pinch of sea salt and a twist of black pepper. Give this a good mix and lay them on some tinfoil. Lay the tarragon over the top and wrap them up in the tinfoil like a parcel. Bake this at 180 °c for 30 mins or until the leeks are completely soft, then allow to cool completely. Roll out the puff pastry to about 6 cm wide and start to build up the leeks. Start by laying four leeks on the bottom, sprinkle some of the thyme leaves on top and shave over some of the parmesan. Build up from there, repeating the same steps, but only go four wide at any point. Wrap the puff pastry around the leeks, ensure the leeks are cool or you will melt the puff pastry. Make sure all the sides and ends of the wellington are sealed and place in the fridge for at least 20 minutes to chill. In a small bowl, whisk the egg with a tablespoon of milk and brush the puff pastry using a pastry brush. Bake at 190°c for 15 minutes, remove from the oven, glaze again and bake at 180°c for a further 15 minutes. Remove from the oven and allow to cool for 10 minutes before carving. Finely shave over more parmesan and serve.